I emailed a reader recently about this feature, which should work for everyone, everywhere. I thought it would be useful to post it here. 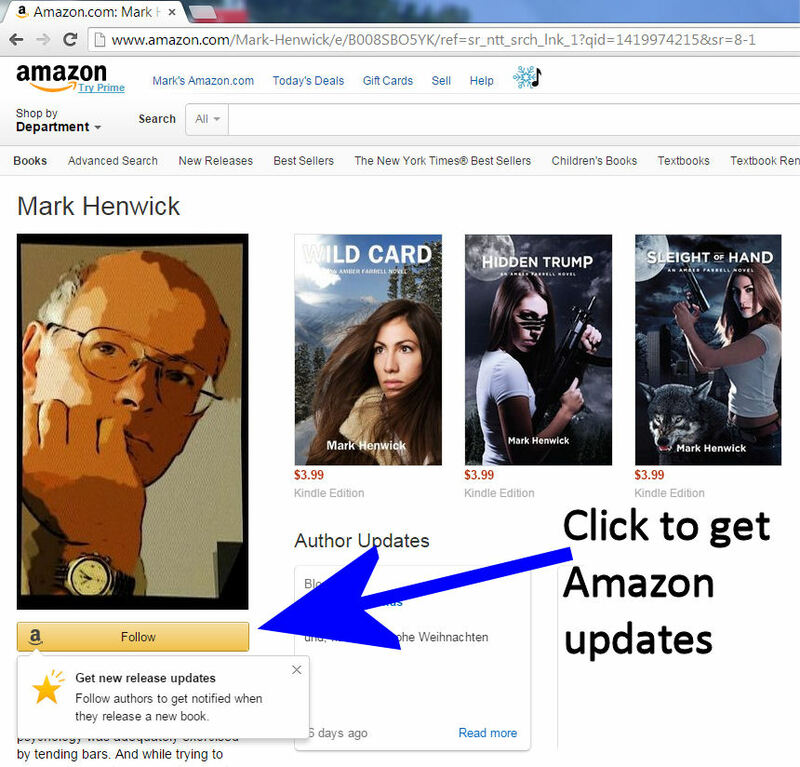 You want to set up Amazon to email you when an author releases a new book. Well, Amazon.com has this feature. The image below shows my author page with the ‘follow’ button underneath my mugshot. This should work, even if you normally log onto the UK or German Amazon web site (they don’t currently have this feature on those sites). The reason it works is that all Amazon sites share your email address, and I believe they should email you whether or not you buy from the Amazon.com website. Please try this (for any author) and report to me if it works. Of course, if you’ve sent me your email address or corresponded with me, I’ll email you my new releases anyway. Yeah, I’ve been signed up for this feature for years, and for numerous authors but it never works! I’ve sent Amazon numerous emails, and examples of my saved authors, and their current releases, as well as my Lack of Notification, and Nothing…….Ever! Now I periodically check my favorite authors myself on a regular basis. It sometimes works, and it is usually several weeks after a book is out. I have NEVER seen it faster then two weeks. OTOH……Any news on the next book? Thank you Lane and Mark for your feedback. I had heard that the service had ‘improved’, which led me to do this post. Maybe if enough people try it (while still checking their favourite author’s pages manually), and feed back to Amazon, they’ll fix it. It cannot be that hard and it’s in their interest – it sells books FFS! Cool Hand is progressing. My editor is back from vacation on the 5th and I am aiming to have the final pre-full-edit draft to her on that day or during that week. So… still reasonably confident for a January release. subscribed and subscribed, we will see, i still check my favorite Authors manually too. I hope you had a great xmas, with your family and good food. I wish you and your family a happy new year, with health, which i deem most important. Hi Mark, I’ve been signed up to a handful of authors for over 6 months and only once have I had an email regarding a new release and that was approx 6 weeks/2 months after the release so actually I think it was a fluke that I got that particular authors book release as an email, as Amazon do often send me emails regarding new books in the genres that I most commonly read. I’ve picked up quite a few new favourites that way. I’ve a feeling that’s how I got Susan Illene’s first book, and then she recommended you. I have to say emails from Amazon are not so on target for me as they used to be. Personally the moment I like an author I sign up on their website and follow on Facebook if they have those options, but then reading is my main hobby, I know not everyone does that. Will manually sign up to Connie’s site (must get started on her series!). I am still of course very willing if you’re needing the second half of Cool Hand beta read 🙂 Hope Christmas was fabulous, Happy New Year!